I picked up the new base for my XXL yesterday. The finish on the MIC 6 was like a mirror . I could just imagine how the shop lights would reflect back at me. So today decided to engine turn a pattern into the base. Not to sure that I would want that as a everyday job!!. Tomorrow I will be pulling the old base off and installing it!! Alright, you have to let us know where you got it and (if you don’t mind) what it set you back. 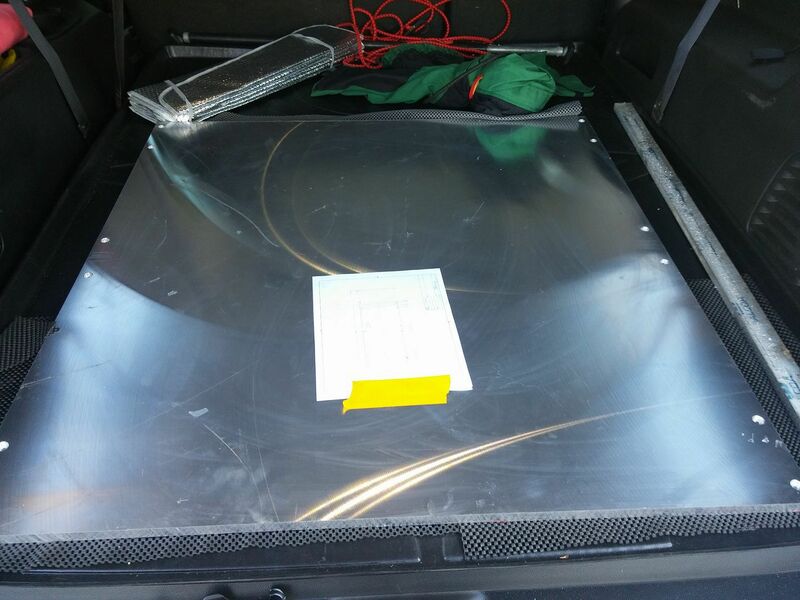 I am talking with Ohio Diesel Parts, since they already make a set for the XL and they are working on an XXL plate. It’s preliminary right now, so not sure if it is going to be 1 plate or 2. Trying to decide if I want to go with a plate like that tapped at 2" with 1/4"-20 or go with the Misumi extrusions I’ve seen. I like the idea of the T-slot, but I also prefer the drop-in ability with a 0.75" aluminum bed that is a drop in replacement for the MDF bed. When originally quoted on the job I chose .5" 6061. ($675 for the 6061,$800for the MIC6) When he recieved the piece of 6061 it had a 1/8" ridge in the middle of the piece. Long story short the piece I got was a drop that he picked up for a great price. It has a really nice flatness tolerence of .015. Waiting for all these XXL initiatives to come to fruition… I just got back from CES and I’ve been out of touch here. Russell has posted up some 2-panel base plans, but I had issue trying to verify his .step file. I had also emailed Ohio Diesel way back, and pleased to learn here they’re looking at an XXL offering. I did an ali base for my S3, I really over complicated it. Get some aluminium of the correct size and thickness. Mark the frame holes and hand drill, only 2 of the holes need to be sunk and those are at the front then use the Shapeoko to mill the mounting holes - it’s what I wish I did rather than messing around designing a base getting quote then not even using it. what I’d do is drill the m5\m6 holes with the shapeoko then drill tap the holes. I think for my wasteboard drilling the holes by hand (electric drill) took about an hour. If I recall I have about 100 holes. Tapping took less then 10 min using a m5 drill tap in my dewalt drill. Unless your producing many boards the cost won’t come down (I looked at small production runs). The actual frame mounts don’t actually need to be all that accurate (2mm deepening the size of bolt) as you have to square your machine. By using the shapeoko to mill the holes you get the best of both worlds, lower price tidy look and feel. 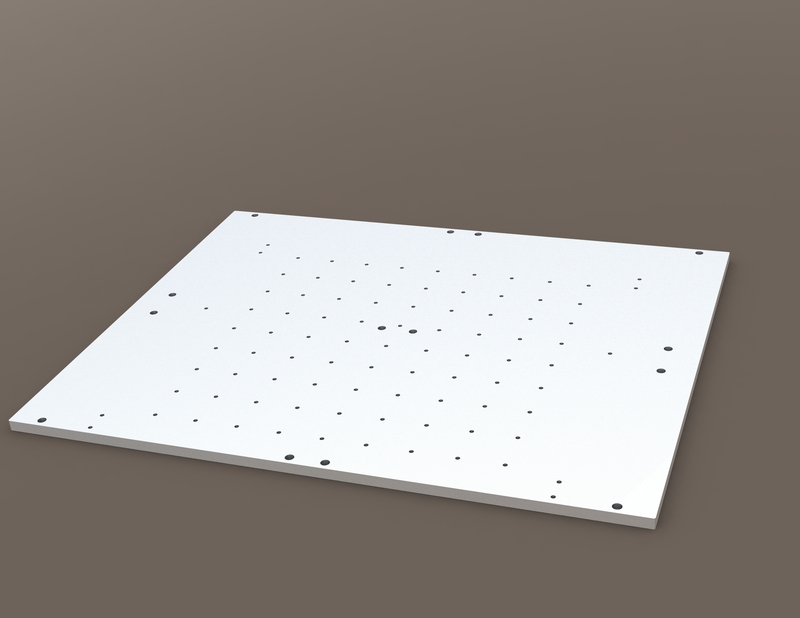 I did my whole board by hand and I wish I used the shapeoko to mill the holes - whilst mine are at 5cm spaces I can see some are slightly off - granted it makes no difference to the work holding. Something to think about when making one for the xxl is what type of items are you milling? If only big things you need less holes. In my eyes the main benefits to the aluminium base is the ability to stick things to it, and the ridigity. I do allot of small items under 15cm and I’m considering making a small nomad style board that bolts onto normal wasteboard. My “nomad sized” board is about 15" square, and has a bunch of threaded inserts in it. It’s then attached to the lower board, which has t-tracks. If I had it to do over, I’d probably do the whole thing as one big threaded table. At the moment, the “subtable” is mdf, but have been meaning to replace it with an aluminum one. Any progress on this? I am looking for an aluminum base for my XXL. There doesn’t seem to be much information out there. 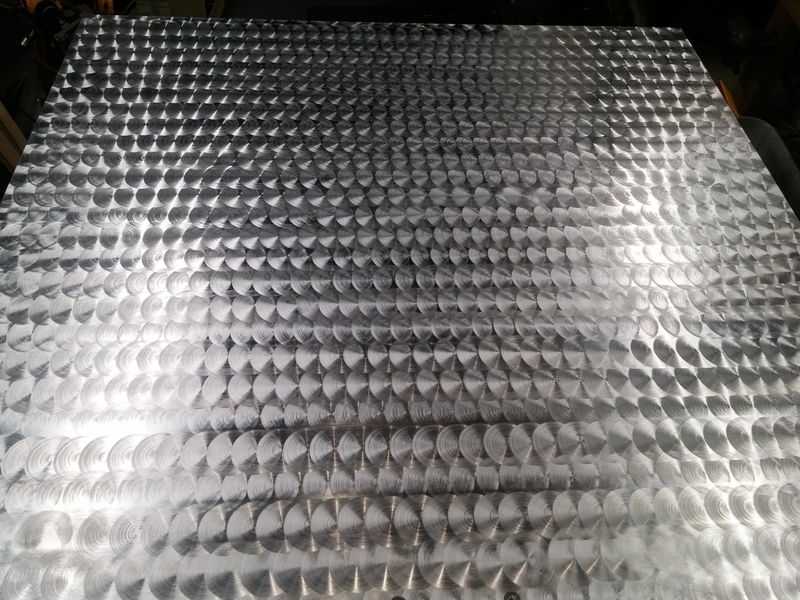 I am looking at buying a mic6 plate .5" thick from (https://www.midweststeelsupply.com/store/castaluminumplateatp5). First off, a little about me as this is my first post and I am very new to the whole forum area so bear with me. I am 31 years old, from Tx, was a cnc machinest for 5 years and a cnc machine programmer for the last 7. I have access to large cnc horizontal mills for which to machine that plate. I built a torsion style table for the xxl to sit on and started thinking about if I were to mill a shoulder where the y axis plates bolt to the bed and do away with the supports under the bed, that way the aluminum would sit flat on the table. Would this make sense to do? The aluminum bed, a water cooled spindle and a linear guided ball screw driven z axis are my plans to upgrade my machine once it is paid off. Im just thinking ahead, as I tend to over analyze everything(according to my wife). She calls it analysis paralysis ;). What do y’all think? some guys create a pocket or slot in the bed to set a decent size mill vise (4"+ jaws) for easy fixture. just a thought since it would seem suitable with the rest of the build. If the 1/2" aluminum is sitting on your table, the maximum screw penetration from fasteners will be 1/2. Having the aluminum lifted a little gives you some wiggle-room on screw length. With aluminum I don’t think you have to worry that much about stiffness. Maybe add a support or three about halfway, something adjustable from the top of the bed. Since the Carbide 3d aluminum bed is always out of stock and the only available one for sale is a 2 piece design, I designed a bed and I am going to have it machined. I may do a small production run and sell a few based on response. Retail would be $400-450. 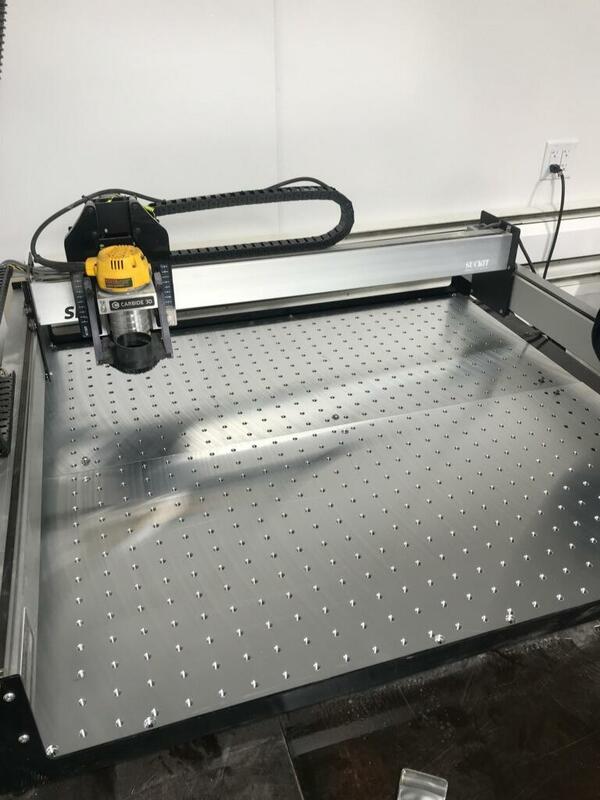 What features would you change from the original Shapeoko 3 Aluminum Bed? I was contacted last night by Ohio Diesel Parts regarding the XXL aluminum base. It looks like they have a base plate now and are going to be selling (at least a few of) them. Threaded 5/16-18" on 1" centers using ATP5 fixture plate billet alum. .005" flatness. I asked about 1/4"-20 since I have ~$300 in stainless SHCS and clamps in 1/4"-20 and they said no problem, so if you want to go that route, they will accommodate you. Okay, Ohio Diesel Parts has put the XXL aluminum base on their website, right here. It is $775+S/H to your location. I am getting one made, but with 1/4-20 holes, since I have ~$300 in stainless SHCS and clamps. For that configuration it is $50 more. If enough people are interested in that thread pattern, the price may come down. That is not something Ohio Diesel Parts said, I am just guessing / hoping. Right now, the 1/4-20 is a one-off, so I am gladly paying the extra fee. They can make up to 3 sets a day if demand calls for it. Riley, from ODP said to call or email him with any questions you may still have. Interesting but I keep thinking that this piece of sheet metal is basically half the price of a brand new Shapeoko XXL. Yeah, almost the same economics for an SO3 ($400 is almost half $1,100). Physics are inexorable.